The United States Census Bureau estimates that in 2014, nearly 11 percent of Coloradans had some form of mental or physical disability, and over 900,000 residents were over the age of 60. Many of these individuals received care in long-term, live-in facilities removed from the vitality of community life. Through the Colorado Choice Transitions (CCT) program, the Department of Health Care Policy and Financing (HCPF) is working to re-integrate some of these individuals back in to society. CCT is part of the Centers for Medicare & Medicaid’s Money Follows the Person (MFP) Demonstration Program, launched in March 2013. MFP helps individuals in long-term care facilities return to their communities by removing barriers that prevent such transitions and strengthening the delivery system for home and community-based services. Forty-five states are part of the MFP program and are dedicated to reducing reliance on institutional care and making widespread changes to the long-term care system. Sam Murillo, Project Director, explains that CCT “is a five year program during which Colorado aims to transition 490 individuals from institutional settings into the community.” To meet their goal, HCPF is increasing utilization of Home and Community Based Services (HCBS) as well as improving the state’s long-term services and supports including waiver simplification and single entry point redesign. 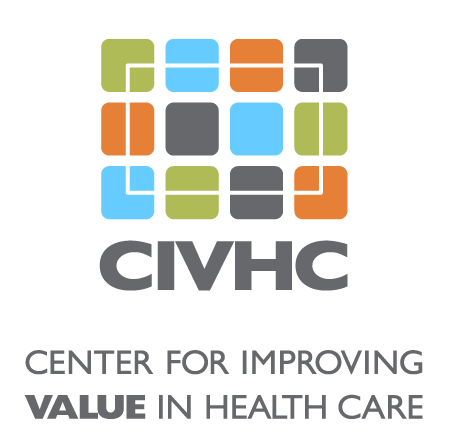 Colorado Medicaid members who are elderly or who have physical disabilities, intellectual or developmental concerns, brain injuries, or mental illnesses are eligible for the CCT program. Murillo emphasizes that transitions are initiated by the individual, “[f]irst and foremost, the process begins with the individual’s choice and the individual’s goal to live in the community.” Interested individuals are referred to a Local Contact Agency (LCA), which conducts Options Counseling to help the member understand what their options are for community living and what services and supports exist in their area. Three out of four CCT participants need financial support to find accessible housing or to adapt existing homes to ADA requirements. 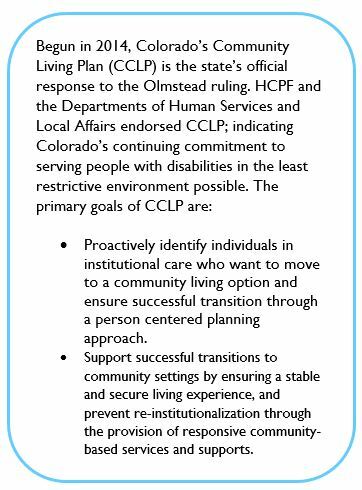 Funding from the Colorado state legislature helped CCT and the Division of Housing create the infrastructure necessary to dedicate resources for the oversight of the home modification benefit, administrate State housing vouchers, and manage Options Counseling in response to referrals from nursing facilities. CCT is providing an opportunity to create and fund non-traditional activities, such as housing navigation. HCPF has also established contracts with Local Contact Agencies across the state and initiated the development of Regional Transition Committees to help identify local barriers to integration. 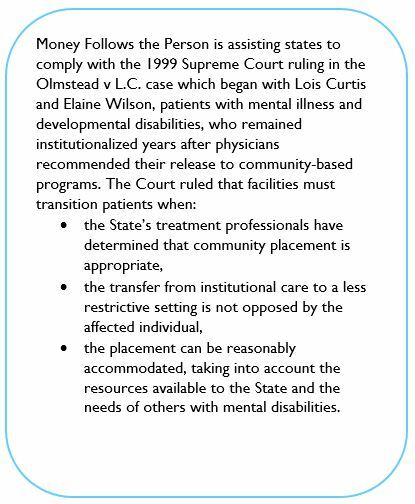 In the official Opinion of the Court on the Olmstead case, Ruth Bader Ginsberg notes, “institutional placement of persons who can handle and benefit from community settings perpetuates unwarranted assumptions that persons so isolated are incapable or unworthy of participating in community life.” HCPF’s thoughtful and meaningful development and implementation of both CCT and CCLP are striking down such assumptions in Colorado and bringing these valuable individuals back into our communities.